Our aim was to evaluate retrospectively the functional and speech outcomes of this technique in the management of VPI following surgically repaired cleft palate. The mean ± standard deviation of age were 7.6 ± 5.4 years old and there were 7 male patients (46.7%) and 8 female patients (53.3%). All the patients or legal responsible parties who agreed to participate in this study signed an informed consent. Our inclusion criteria were that the patients had to meet the following criteria to qualify for the study: They had a primary repair of the palate (with or without a cleft lip or alveolus) and they had at least 75% of normal language development for their age. Moreover, the exclusion criteria included one or more of the following: The cleft being a part of syndrome, mental retardation, obstructive sleep apnea (OSA) syndrome, and patients who underwent previous surgery for VPI. No patient was suspected to undergo a primary palatal muscular dissection. Preoperative assessment included full history taking, complete clinical examination in consultation with internal medicine, pediatrician and anesthesia team. The speech assessment was done based on the Pittsburgh weighted values of speech symptoms associated with VP incompetence  with our modification. Both articulation and voice assessment were done preoperative and postoperative but were not addressed in the results as the effect of operation was mainly on the degree of nasality rather than the articulation errors, which were corrected by speech therapy and voice disorders, which needed counseling to eliminate damaging vocal behavior and to reduce vocal loudness. Auditory perceptual assessment of the patient's speech was done by determining the type and degree of nasality. Comment on consonants whether omitted, substituted or distorted. Compensatory articulator mechanisms were also looked for if present, either glottal or pharyngeal. Furthermore, facial grimace and audible nasal air escape were assessed. Overall speech intelligibility was then determined. Degree of dysphonia was judged as well as voice character, pitch, and loudness. We made an audio-video recording of voice; the recording of the patient's conversational speech was done for illiterate patients, whereas others were asked to read a standardized passage. All patients attended postoperative speech therapy sessions for 3 months followed by flexible fiberoptic nasopharyngoscopy assessing the palate movement, lateral pharyngeal wall movement, posterior pharyngeal wall movement and pattern of closure and be it either limited or good as shown in [Figure 1]a and b. Speech outcomes were objectively based on three structurally correctable variables: Resonance (normal, mildly hyponasal, mixed hypo-hypernasal, inconsistent mildly hypernasal, mildly hypernasal, moderately hypernasal, severely hypernasal), functional outcomes were evaluated by nasal emission (absent by mirror examination, visible, audible, and turbulent), and by flexible fiberoptic nasopharyngoscopy grading the persistent gap: absent gap if length is (≤2 mm), mild gap if length is (2-4 mm), moderate gap if length is (4-7 mm) and large gap if length is (≥7 mm). The measurement was done through special graded ruler attached to the endoscopy. Our classification was based on the obtained values of VP area, VP closure was classified according to Warren  into: Adequate (0.000-0.049 cm 2 ), adequate/marginal (0.050-0.099 cm 2 ), marginal/inadequate (0.100-0.199 cm 2 ), and inadequate (≥0.200 cm 2 ), by mathematic calculation we can find that the gap length, as the width of the area average is 2.2-2.5 cm. The equation is: VP surface area (cm 2 )/width of the area (cm) = the length of the gap area. Result is as following; adequate if length is (0.000-0.020 cm), adequate/marginal if length is (0.020-0.040 cm), marginal/inadequate if length is (0.040-0.079 cm), and inadequate if length is (≥0.079 cm). Insufficient (moderate or severe hypernasal resonance, audible or turbulent nasal emission and large gap). Normal or borderline competency was categorized as a success while borderline insufficiency or insufficiency was categorized as a failure. Furthermore, we used pure tone audiometry to the patient, but we did not include them. The polysomnography was conducted, if a child evidenced symptoms of OSA postoperatively. After endotracheal intubation and Dingman's mouth gag in place, we infiltrated the palate and posterior pharyngeal wall with 0.5% lidocaine and 1:200,000 of epinephrine. Then, we started the surgery by a midline incision in the soft palate [Figure 2], followed by dissection of both oral and nasal mucosa from the palatal muscle [[Figure 3]a and b]. Second, the mucosal flaps are raised from the posterior pharyngeal wall with the formation of two lateral openings (ports). Nasal stents are placed transnasally into the hypopharynx to fit the lateral ports. The amount of lateral pharyngeal wall motion will determine how wide the flap needs to be to achieve VP competence. A SBF is transversely incised inferiorly and raised to a level above the palatal plane, which usually corresponds to 1-2 cm above the tubercle of the Atlas More Details. Flap length should be limited to that which is required, to be inserted into the soft palate without significant tension and the width of the flap determined by the degree of preoperative lateral pharyngeal wall adduction. The designed flap inserted into the nasal mucosa of the soft palate and sutured. The donor site is closed with 3-0 Vicryl suture. Moreover, suturing the flap to the nasal mucosa, followed by lining of the raw surface of the flap using nasal mucosa of the soft palate to a small triangular from both nasal side of the mucosa covered the undersurface of the flap reduce postoperative contraction [[Figure 4]a and b]. In addition, posterior displacement of the tensor and levator veli palatini muscles is done by separating them from their abnormal attachment to the posterior palatine edge and opposing them, and then sutured to each other [[Figure 5]a and b]. Then, 4-0 Vicryl sutures are used to sew the oral mucosa [Figure 6]. Finally, a 30° endoscopy is used to evaluate the lateral ports. If the port is too large (the flap is loose around the stent), additional sutures are placed to wrap the flap around the nasal stent (purse string suture on both side of the free area of the flap), could be easily adjustable [Figure 7]. The lateral port closure should not be under tension. 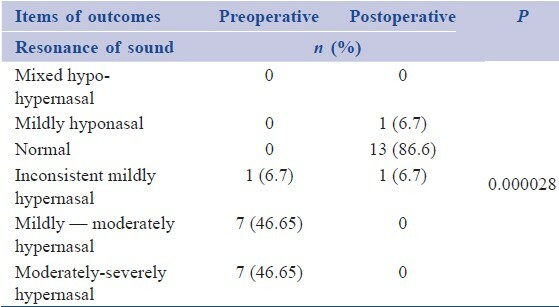 This is a retrospective analysis of the patients who underwent a combination of the SBF pharyngoplasty techniques with radical intravelar veloplasty (RIVVP) and summarized in [Table 1], [Table 2], [Table 3]. Qualitative data were presented as frequencies and percentages. Chi-square (χ2 ) test and Fisher's exact test were used to compare pre and postoperative results. The significance level was set at P ≤ 0.05. Preoperatively 14 patients (93.4%) had hypernasality. However, the normal resonation was achieved in 13 patients (86.6%) postoperatively with a significant difference from preoperative assessment (χ2 = 26.29 and P = 0.000028). Preoperatively, turbulent nasal emission was recorded in twelve patients (80%), that persisted with only one patient (6.7%) postoperatively. Nasal emission was absent or inconsistently visible in six patients (40%) and visible or inconsistently audible in eight patients (53.3%) postoperatively with significant difference from preoperative assessment (χ2 = 17.58 and P = 0.000152). All cases had a short palatal length preoperatively with pharyngeal gap ≥10 mm. The pattern of closure was equal in coronal, sagittal and circular with five patients (33.3%) each. The circular movement of the palate was achieved in 12 patients (80%) with significant difference from preoperative assessment (χ2 = 6.83 and P = 0.032). 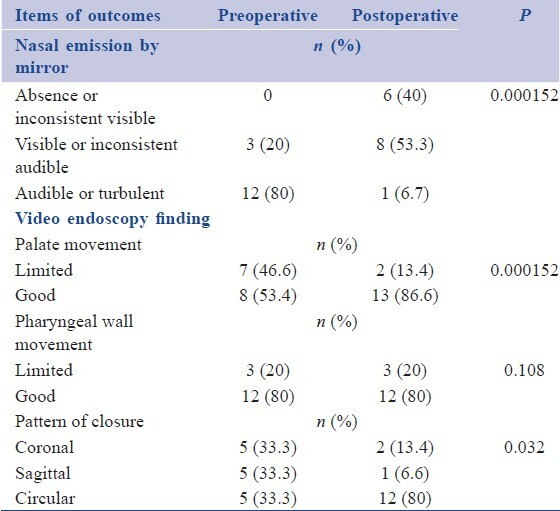 In addition, the postoperative evaluation reveals that there were 12 patients (80%) with absent (≤2 mm) pharyngeal gap [Figure 8]. However, there were three cases complicated by OSA postoperatively, but on follow-up; they improved gradually after 6 months. However, the early postoperative airway obstruction was in five cases for a few days. In addition, two cases developed postoperative infection. After medical treatment for infection one case resolved and second developed partial flap necrosis (small palatal fistula). There was no case with intra or postoperative bleeding. The treatment of cleft lip and palate aims to obtain a result that enables the normal anatomical and functional development of each patient. The inadequacy of speech and voice derived from VPI is a major stigma for cleft patients. Therefore, it is essential to treat the VPI to improve the development of children with this VPI and to improve their relationships with family, friends, and the community. The success rate with SBF with RIVVP technique was 93.4% and the VP function became normal (circular pattern of closure) in 12 patients (80%). In addition, the success rate of postoperative overall VP competence grades was 93.4%, in the form of normal in 10 patients (66.7%) and borderline competence in four patients (26.7%). Moreover, there was 6.6% failure rate in the form of one patient with borderline insufficiency as described in [Table 4]. However, Jarvis and Trier compared 91 patients who underwent SBF and intravelar veloplasty with 39 patients who underwent SBF only. They assume that 92% from each group obtained VP adequacy, regarding that the success criteria in resonation of sound are within normal, mildly hyponasal, mildly hypernasal and mildly-moderately hypernasal. There was no statistical improvement in speech when intravelar veloplasty was added. Our success criteria in resonation of sound were within normal and mildly hyponasal only differed from Jarvis and Trier success criteria in resonation of sound as they included normal, mildly hyponasal and mild hypernasal. Moreover, those authors did not describe the type of intravelar veloplasty and how they did it; in addition, they depended only on the speech outcome with applying the measurable tools (aerodynamic study only) to few patients without assessment of the palatal movement by endoscopy or fluoroscopy, therefore, the functional outcomes was not mentioned in their article. Regarding our technique, we did RIVVP and the success criteria in resonation of sound are normal to mildly hyponasal only. Furthermore, we assessed palatal function through fiberoptic endoscopy to measure the persistent gap. Therefore, we answered the question (whether the addition of RIVVP to SBF improve the palatal movement or not?). Hence, we found that there is more dynamic action of the palate by adding RIVVP to SBF as the circular movement of the palate was achieved in 12 patients (80%) with good movement of both palate and pharynx in 13 patients (86.6%). According to Zwitman  , the VP dynamic after the superior based flap, both apparent size of pore and the amount of tissue displacement was variable. Moreover, the port closure was accomplished by one of the following physiological process; velum is already attached in a superior position and moves more posteriorly during phonation. The most lateral aspect of velum narrowed the pharyngeal pore and the lateral wall movement filling all or part of the port, the posterior wall move anteriorly; however, the posterior movement was limited 2-3 mm and was observed when the lateral motion was absent. Furthermore, Karling et al. stated that "their results revealed a potential for adaptation of pharyngeal wall adduction to different flap widths. The magnitude and character (increase or decrease) of change in adduction were significantly correlated with the degree of preoperative adduction and with the width of the flap." Moreover, they stated that "the patients with limited preoperative adduction, pharyngeal wall activity increased, more in the presence of a narrow flap while less if the flap was wide." Hence, with use of "the tailor-made flap" described by Shprintzen, as the base of the pharyngeal flap positioned at the site with the greatest level of lateral pharyngeal wall movement and adjustment of the base width of the flap, this result could occur. This explains our result and how the VP function became normal (circular pattern of closure) in 12 patients (80%). 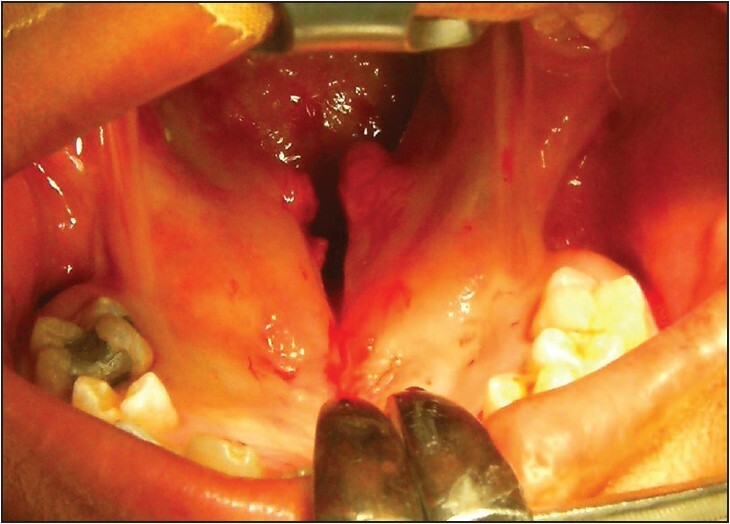 One of the most common complications of pharyngeal flap surgery for VPI is OSA. We found in our technique that, the early postoperative airway difficulty (oxygen saturation >92%) was in five patients (33.3%) for a few days due to the postoperative edema and crustation. However, three patients (20%) were complicated by OSA postoperatively; they improved gradually after 6 months. The complications encountered were three patient with OSA, one case with infection and fistula and one case of infection only. These results correlate with similar researches as Liao investigated the incidence and severity of OSA after pharyngeal flap surgery to determine the effect of patient age and flap width. In the pediatric group, mild OSA was found in 42% and 58% had moderate to severe OSA. No correlation was found between OSA and flap width. Morris et al. reported postoperative snoring in 89.2% of patients. However, Shprintzen was unable to correlate flap width with the degree of postoperative OSA, but noted contributing factors such as decreased airway size, enlarged tonsils, alteration of the respiratory pattern, and syndromic elements after pharyngeal flap surgery. Valnicek noted an overall 16.4% incidence of complications that includes one death. 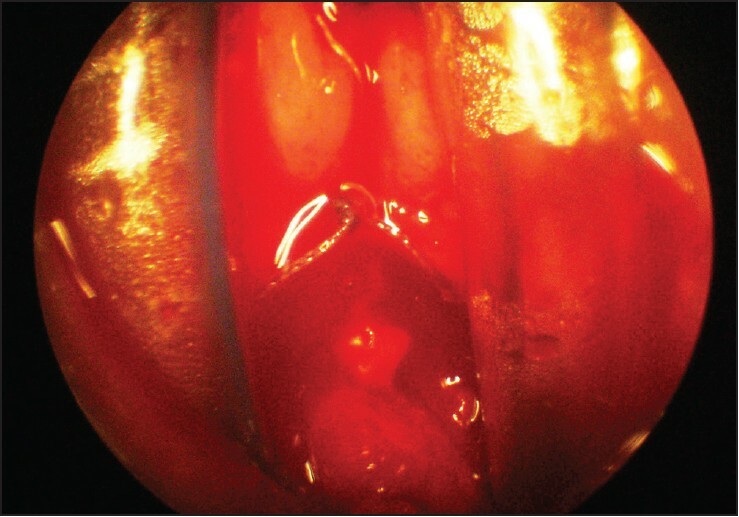 Postoperative bleeding occurred in 8%; airway obstruction, usually within the first 24 h postoperatively, developed in 9%, and 1% required re-intubation. The incidence of OSA was 4%. Moreover, we found in SBF with RIVVP technique that, the overall incidence of complications was 33.3%. Shprintzen recommends primary tonsillectomy as a separate procedure if it appears that the enlarged tonsils will be a problem. According to Senders,  the adenoids may limit the superior level of flap placement and may need to be removed to allow for a more superior base. Therefore, we recommend tonsillectomy if the tonsils were enlarged (2+ or greater). The tonsillectomy was done at least 6 weeks prior to the pharyngeal flap. Four children had preoperative tonsillectomy and three had an adenoidectomy. Despite good result of our study, small sample size does not allow us to get statistically significant conclusions full orientation of outcomes. Another criticism of our report would be that the speech outcomes are objective description of speech characteristics. Hence, the level of speech outcome cannot be compared with other reported outcome. Hence, we encourage more patients to undergo the new technique and a longer time for follow-up. We acknowledged Prof. Sahar I. Yassin, professor of public health- Faculty of Medicine, Cairo University, Cairo, Egypt, for her help in statistical work. By doing SBF pharyngoplasty (modified Hogan's flap) combined with RIVVP, the surgical procedure was satisfactory in both functional and speech outcomes, with average complication outcome range. Igawa HH, Nishizawa N, Sugihara T, Inuyama Y. A fiberscopic analysis of velopharyngeal movement before and after primary palatoplasty in cleft palate infants. Plast Reconstr Surg 1998;102:668-74. Seibert RW, Bumsted RM. Cleft lip and palate. In: Cummings CW, editor. Otolaryngology Head and Neck Surgery. 2 nd ed. St. Louis: CV; 1993. p. 1128-64. Moss AL, Pigott RW. Hynes' pharyngoplasty revisited. Plast Reconstr Surg 1987;80:866-7. Crockett DM. Velopharyngeal insufficiency. In: Healy GB, editor. Common Problems in Pediatric Otolaryngology. Chicago: Year Book; 1990. p. 460-3. Senders CW. 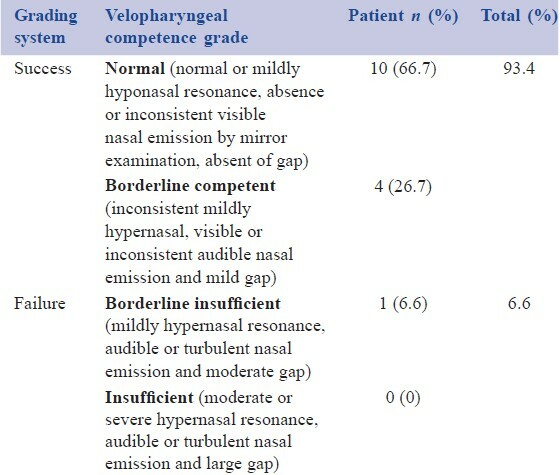 Management of velopharyngeal competence. Facial Plast Surg Clin North Am 2001;9:27-35. Schoenborn K. On a new method of staphylorrhaphy. (Translated by Stellmach RK. Reprinted in Plast Reconstr Surg 1972;49:558). Quoted from Gosman A. Cleft lip and palate II: Surgical management. Sel Read Plast Surg 2007;10:45-57. Fischer-Brandies E, Nejedlo I. A modification of the Sanvenero-Rosselli velopharyngoplasty. J Craniomaxillofac Surg 1993;21:19-21. Sommerlad BC. Surgery of the cleft palate: Repair using the operating microscope with radical muscle retropositioning - The GostA approach. B-ENT 2006;2 Suppl 4:32-4. Braithwaite F, Maurice DG. The importance of the levator palati muscle in cleft palate closure. Br J Plast Surg 1968;21:60-2. Kriens OB. An anatomical approach to veloplasty. Plast Reconstr Surg 1969;43:29-41. Andrades P, Espinosa-de-los-Monteros A, Shell DH 4 th , Thurston TE, Fowler JS, Xavier ST, et al. 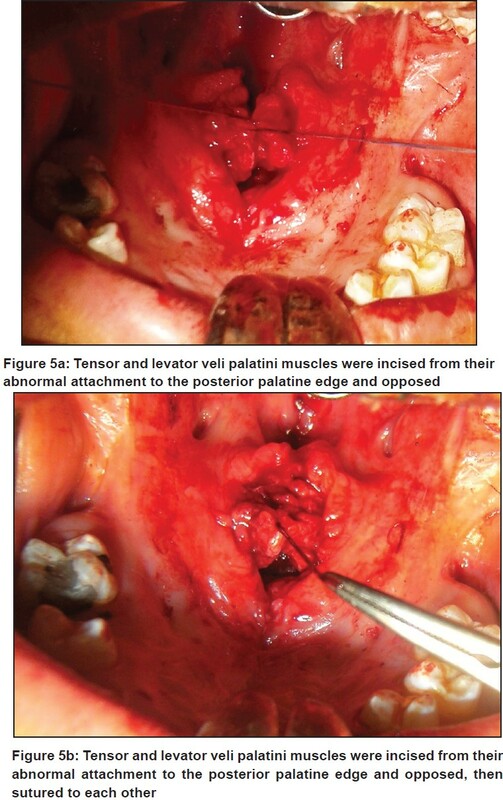 The importance of radical intravelar veloplasty during two-flap palatoplasty. Plast Reconstr Surg 2008;122:1121-30. McWilliams BJ, Philips BJ. Velopharyngeal Incompetence: Audio Seminars in Speech Pathology. Philadelphia: WB Saunders; 1979. Warren DW. Aerodynamic assessments and procedures to determine extent of velopharyngeal inadequacy. In: Bzoch KR, editor. Communicative Disorders Related to Cleft Lip and Palate. 4 th ed. Austin: Pro-Ed; 1997. p. 411-37. Sullivan SR, Vasudavan S, Marrinan EM, Mulliken JB. Submucous cleft palate and velopharyngeal insufficiency: Comparison of speech outcomes using three operative techniques by one surgeon. Cleft Palate Craniofac J 2011;48:561-70. LaRossa D. The state of the art in cleft palate surgery. Cleft Palate Craniofac J 2000;37:225-8. Gosman A. Cleft lip and palate II: Surgical management. Sel Read Plast Surg 2007;10:45-57. Marsh JL. The evaluation and management of velopharyngeal dysfunction. Clin Plast Surg 2004;31:261-9. Sloan GM. Posterior pharyngeal flap and sphincter pharyngoplasty: The state of the art. Cleft Palate Craniofac J 2000;37:112-22. 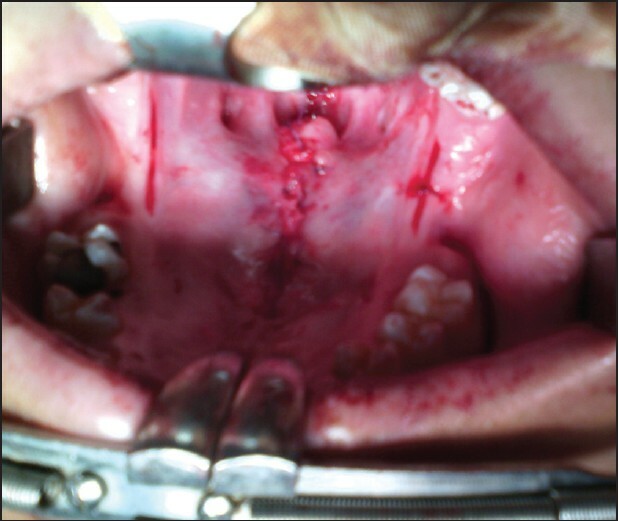 Seyfer AE, Prohazka D, Leahy E. The effectiveness of the superiorly based pharyngeal flap in relation to the type of palatal defect and timing of the operation. Plast Reconstr Surg 1988;82:760-4. Seagle MB, Mazaheri MK, Dixon-Wood VL, Williams WN. Evaluation and treatment of velopharyngeal insufficiency: The University of Florida experience. Ann Plast Surg 2002;48:464-70. Morris HL, Bardach J, Jones D, Christiansen JL, Gray SD. Clinical results of pharyngeal flap surgery: The Iowa experience. Plast Reconstr Surg 1995;95:652-62. Jarvis BL, Trier WC. The effect of intravelar veloplasty on velopharyngeal competence following pharyngeal flap surgery. Cleft Palate J 1988;25:389-94. Zwitman DH. Velopharyngeal physiology after pharyngeal flap surgery as assessed by oral endoscopy. Cleft Palate J 1982;19:36-9. Karling J, Henningsson G, Larson O, Isberg A. 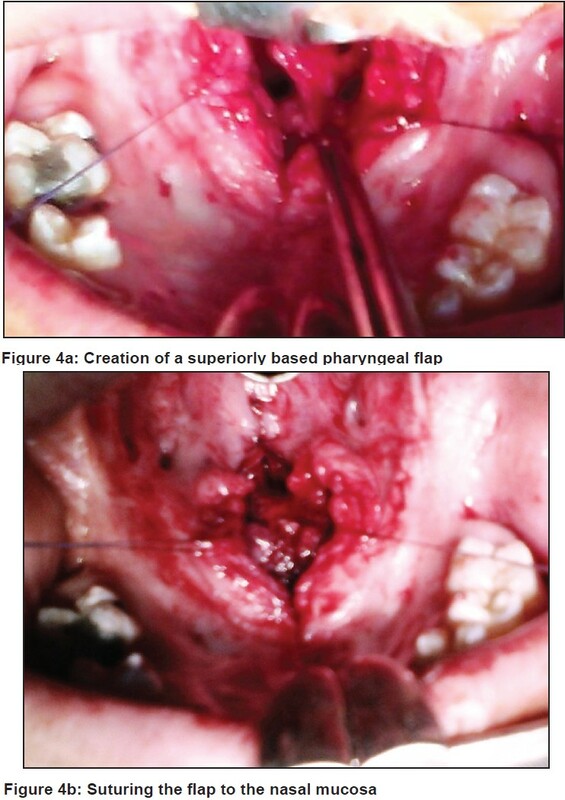 Adaptation of pharyngeal wall adduction after pharyngeal flap surgery. Cleft Palate Craniofac J 1999;36:166-72. Liao YF, Chuang ML, Chen PK, Chen NH, Yun C, Huang CS. Incidence and severity of obstructive sleep apnea following pharyngeal flap surgery in patients with cleft palate. Cleft Palate Craniofac J 2002;39:312-6. Shprintzen RJ. Pharyngeal flap surgery and the pediatric upper airway. Int Anesthesiol Clin 1988;26:79-88. Valnicek SM, Zuker RM, Halpern LM, Roy WL. Perioperative complications of superior pharyngeal flap surgery in children. Plast Reconstr Surg 1994;93:954-8.